Each of the upper ranks and experts of the big families was currently astounded. Although they could feel that Ji Chao was already near the end of the Yuan Soul Realm, they had never imagined that Ji Chao was already at the Peak of Yuan Soul Realm and may already be almost at the Yuan Xuan Realm. A 15-16 years old Yuan Xuan Realm. This was terrifying for the experts and upper ranks of the families present. His future was limitless. Currently, as the aura surged out from Ji Chao, a strange feeling shrouded over Su Yi’s body. The hairs of Su Yi all stood on their end. He could clearly feel that he had been locked on by Ji Chao. At that moment, from within Su Yi’s body, there was a strange aura diffusing out quietly. As if it was being called out by powerful aura on Ji Chao, A strange aura began to awaken from within him. At the same time, crimson red permeated his irises unnoticed by others. When Old Master Su Yun Tian felt the aura on Ji Chao, he started worrying. Yuan Soul Realm First Grade to Ninth Grade, every grade was a flight of stairs. Su Yi’s aura showed that he had only just entered the Yuan Soul Realm whereas Ji Chao had almost entered the Yuan Xuan Realm. There was a difference of nine grades. Whoever it might be, this difference would be hard to make up. Naturally, Su Yun Tian worried about Su Yi. Wang Quan De sneered. Ji Chao still had the ability to fight and just now Su Yi had only taken advantage of Ji Chao as he was careless. Now that Ji Chao wants to fight with all his might, that brat would never be a match for him. Hearing this, Su Yun Tian could not say anything. Everyone knew that Su Yi held back just then. If that dagger had landed on Ji Chao’s neck, it was enough to take his life. But talking about it seriously, Ji Chao was not yet defeated. Su Yi had already spat out blood. His injuries looked far more serious than Ji Chao. Ji Chao had suffered skin-deep injuries at the very most. Suddenly, the plaza shook. An aura was bursting out. Feeling this aura, everyone looked at its source. This aura came from Su Yi. Within Su Yi, a powerful aura gushed out like a flash flood. His clothes fluttering, his hair rising, both of his eyes crimson red. If one looked closer, the crimson red looked like it was blazing flames. At this point in time, it was as if Su Yi was an entirely different person. Anyone could feel that Su Yi’s aura now was not restrained. He was only Yuan Soul Realm First Grade. But this aura and presence of Su Yi shocked people greatly. Under the aura of Su Yi, the experts and upper ranks of the big families were all trembling slightly, their hearts palpitating wildly. There was a feeling of them being subjugated at the bottom of their hearts as if they were facing an emperor who had just awakened from his slumber. A Yuan Soul Realm First Grade cultivator could cause such changes in them, how could they not be shocked? Liu Zong Yuan’s eyes shook. It was obvious that the aura of Ji Chao was stronger and greater than Su Yi, but the aura of Su Yi brought along with it an unquestionable authority as if it was an emperor which do not forgive provocations, over-bearing and sharp, majestic and destructive! With both eyes crimson red, currently within Su Yi, as if being oppressed, the “Supreme Chaotic Yuan Technique” started initiating itself. Waves after waves of fighting intent surged in his chest. Under the influence of the fighting intent, Su Yi hollered out those words. His thin physique stood fast and tall. His hair drifting and his robe thumping due to the turbulent winds, endlessly giving people a will to fight. In the midst of the spectators, Fatty Wang could not help but cheer, but when he remembered his father who was sitting beside him, he suppressed his voice. In the sea of people, it was unknown who was cheering, but one after another, there were more cheers from the young people. Many youths were very displeased with what Ji Chao said and honestly, Su Yi’s words already had an ability to incite the masses. So, all the youths in an instant had their blood boiling for a fight, standing together against a common enemy. No matter what, Su Yi represents the city now. 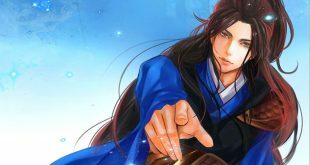 Initially, everyone respected and yearned for the power of the strong, but for Ji Chao, there was no way for the people of the city to accept him. Furthermore, being all pumped up and full of spirit was part of being a youth. Naturally, they had a lower tolerance and were pissed off earlier than the rest of the crowd. Hearing the deafening enthusiastic cheers, Ji Chao’s face became hideous to its limit. Within his body, black Yuan Qi fluctuated as if it was becoming real. It started whirling in the surroundings. The plaza trembled slightly and the ground shook. A horrifying aura spread from Ji Chao, sweeping the bits and pieces of rock and other materials into the air. With such an aura, the eyes of everyone present fell upon Ji Chao again, staring in consternation. The experts and the upper ranks of the families were shocked even more. They all knew that with this kind of aura, no doubt that Ji Chao was a disciple of Sacred Mountain. Their cultivation techniques were not the average ones. Liu Zong Yuan inhaled deeply, repressing the shock in his heart. Cultivation techniques were also separated into the good and the bad. Strictly speaking, techniques and cultivators’ talents were the same. There were also Mortal Grade, Fine Grade, General Grade, Commander Grade, King Grade, Emperor Grade and the legendary Heavenly Grade. Among the techniques, each grade had the Beginning Level, Middle Level, and High Level. In the big families of the city, the Su Family’s “Purple Yuan Technique”, Liu Family’s “Green Cloud Technique” and more, they were all only barely at Fine Grade, Beginning Level. From this, one could see the difference between the City of Man and Sacred Mountain. The eyes of the upper ranks and experts of the families all shook. The difference between the different kinds of techniques was humongous. For the good techniques, whether it be fighting capability or cultivation, they were all far better than the average techniques. It was incomparable.